Source is exactly "Library of Congress"
An issue of Mira'at al-Gharb dated April 21, 1922. An issue of Mira'at al-Gharb dated March 12, 1922. 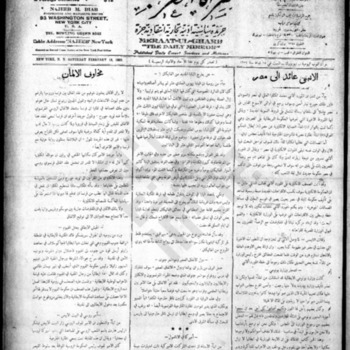 An issue of Mira'at al-Gharb dated February 18, 1922. An issue of Mira'at al-Gharb dated February 15, 1922. An issue of Mira'at al-Gharb dated January 18, 1922. An issue of Mira'at al-Gharb dated April 29, 1922. An issue of Mira'at al-Gharb dated April 28, 1922. An issue of Mira'at al-Gharb dated April 27, 1922. An issue of Mira'at al-Gharb dated April 26, 1922. An issue of Mira'at al-Gharb dated April 25, 1922. An issue of Mira'at al-Gharb dated April 24, 1922. An issue of Mira'at al-Gharb dated April 22, 1922. An issue of Mira'at al-Gharb dated April 20, 1922. An issue of Mira'at al-Gharb dated April 19, 1922. An issue of Mira'at al-Gharb dated April 18, 1922. An issue of Mira'at al-Gharb dated April 17, 1922. An issue of Mira'at al-Gharb dated April 15, 1922. An issue of Mira'at al-Gharb dated April 14, 1922. An issue of Mira'at al-Gharb dated April 13, 1922. An issue of Mira'at al-Gharb dated April 12, 1922.